Did You Know Dine-Aglow Invented Disposable Table Lighting? Did you know that Dine-Aglow pioneered and invented the original table lighting oil lamp system with disposable fuel cartridges? Since 1976 the hospitality and food service industries have been using the Dine-Aglow disposable liquid wax product to illuminate and add ambiance to their restaurants or special events. The introduction of Dine-Aglow revolutionized the table lighting industry by providing a form of portion control, yield and cost per burn hour. Dine-Aglow allowed for a safer, cost effective way for restaurants, caters and the hospitality industry to provide ambiance on the table with a “live” flame. The disposable 100% recyclable plastic fuel cartridge saved business owners a ton of time and money and by adding ambiance to the table restaurateurs noticed patrons staying longer and spending more money. Did You Know About The Product Guarantee? Since day one, we have maintained stringent quality control procedures in every step of the manufacturing process to ensure consistently high quality lamp fuel. Made in the USA, all Dine-Aglow lamp fuels are designed and engineered for optimum use and efficient table illumination. Today Dine-Aglow offers the widest selection of quality Liquid Wax Lamp Fuel with over 16 different fuel sizes and all are guaranteed to perform as advertised. Each product carries decades of manufacturing experience and reliability and is guaranteed to perform as advertised. 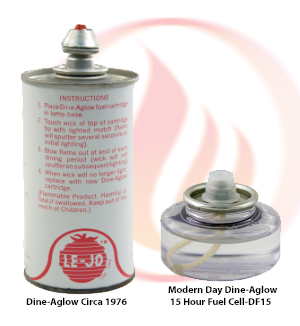 Dine-Aglow is the only manufacturer to offer a True Burn Time Guarantee on all Dine-Aglow Liquid Wax Lamp fuel.